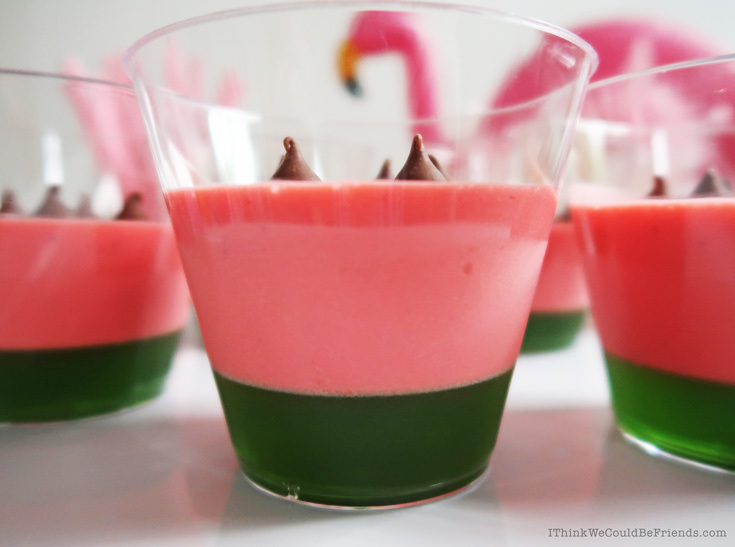 Strawberry Mousse & Lime Jello Dessert Cups look like Watermelon! Simple no-bake summer recipe! 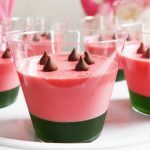 Oh my goodness, our guests RAVED about these easy strawberry mousse dessert cups! With their cute watermelon look, they’re perfect for any summer party, pot luck or picnic. 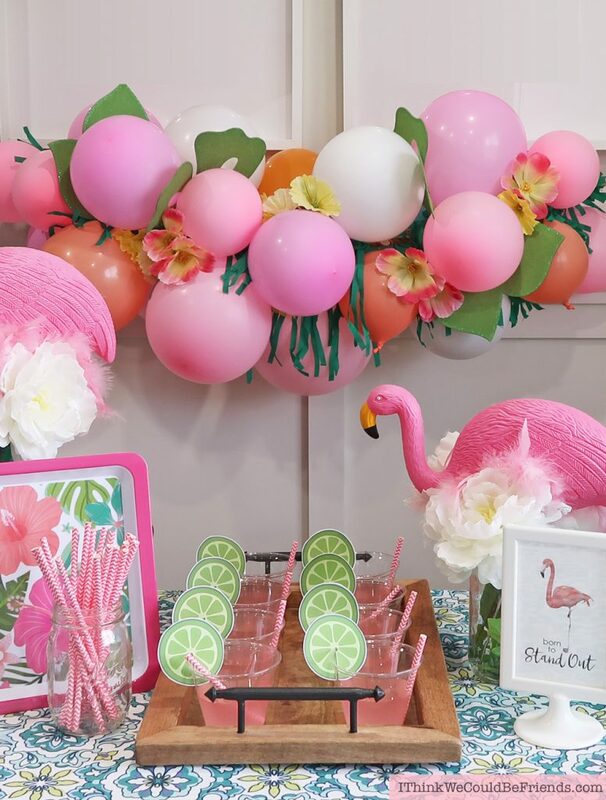 They would also be a great addition to a birthday party or baby shower. I made these for my sister’s baby shower and everyone loved them so much I made them again for Father’s Day! The best part is that they are SO EASY. They are no-bake, so they come together quickly. For this simple strawberry mousse recipe, you actually use real strawberries, which adds a ton of flavor. Basically, you make lime jello for the bottom or the watermelon rind. On top you add the no-bake strawberry mousse. It is an easy but incredibly good recipe! But of course, no watermelon dessert is complete without seeds! So we added chocolate chips to the top. 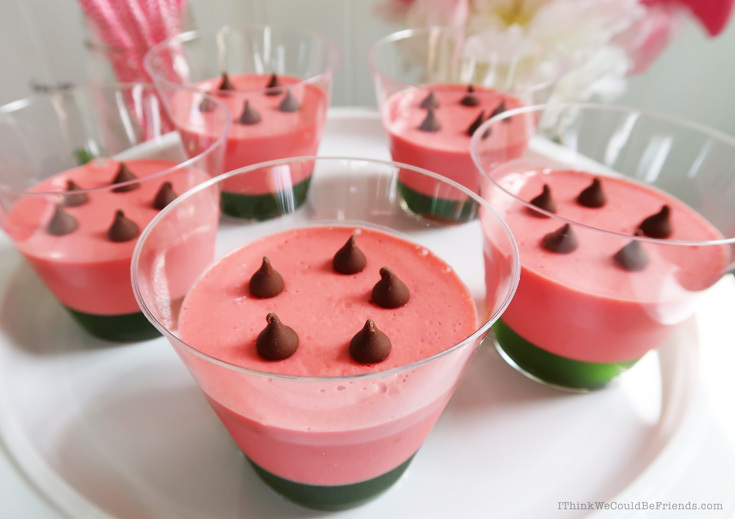 Ok, I know that its a little deceiving that these dessert cups look like watermelon but taste like strawberry! I tried to find watermelon jello at the grocery store, but didn’t have any luck. (They do have it on Amazon, but only in large quantities, so I couldn’t justify it! But I would love to try it!!) But honestly, once you try this incredible strawberry mousse recipe, you’ll forget all about it! 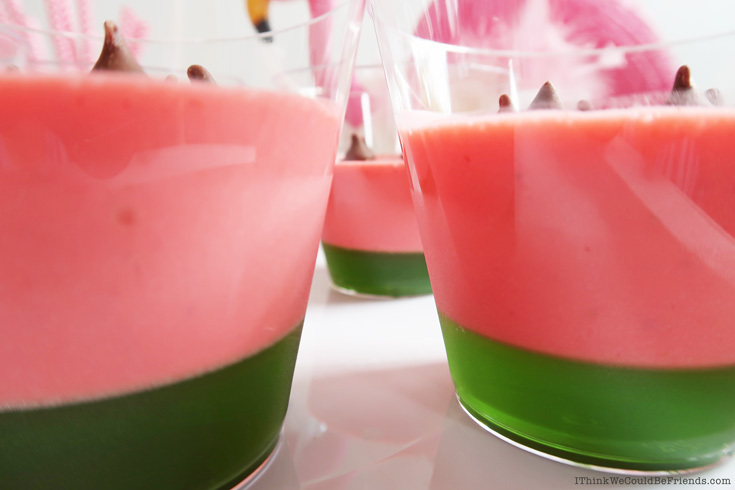 Like I mentioned above, the base of these fun watermelon cups is lime jello. 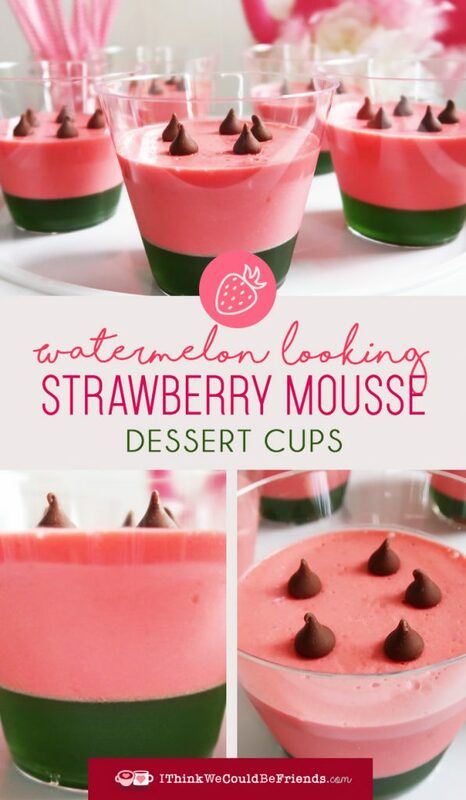 I’m not a huge lime jello fan, but the combination with the strawberry mousse is pure perfection!! The hint of tart balances the sweet of the strawberry mousse so well. These are standard 9oz punch cups. We had them left over from my sister’s wedding (so I could actually make 1,000 of these ;), but I like that the sides are smooth. They don’t have ribs or a lip which I think looks much nicer for the jello and mousse. But of course, use what you have on hand. Just because the cups you have may have ribs doesn’t mean this summer dessert still won’t look awesome. 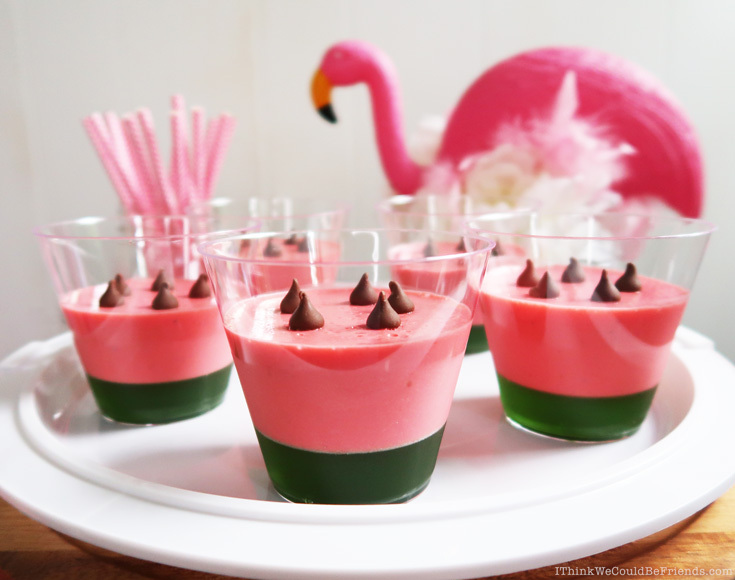 The colorful strawberry mousse and lime jello steal the show! You can make these dessert cups low-carb, too! What’s nice, too, is that these can easily be made low carb. Simply switch our the jello packages for sugar free as well as the cool whip. You’ll have to skip the chocolate chips on top, unless you have a dark chocolate version on hand! But, honestly, you don’t need them. There is plenty of flavor in the mousse! I’ve been adhering to the Keto diet, but summer can be TOUGH, so I love when desserts can be made Keto friendly. Of course, you’ll need to keep an eye on the exact number of carbs that go into yours. How do they handle heat at picnics & outdoor parties? Like I mentioned, I made these for Father’s Day and it was 95 degrees and humid that day. I kept them refrigerated right up until we left. Being a dessert, they didn’t get eaten until 1 1/2- 2 hours after we arrived. However, they still tasted great! They didn’t separate or get watery or break down in any way. They still looked just as cute as when they left our house. 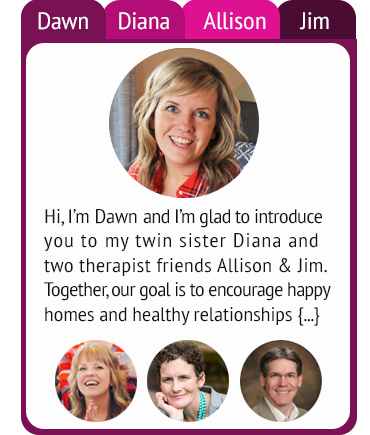 I was glad for this because I will definitely be taking them to every summer party we have! But of course, always use your best judgment and play it safe when it comes to heat and food :) And if you have the option, these are especially refreshing if they can be chilled until they’re served. STEP 1: Prepare lime jello according to package directions. Set out plastic cups and pour jello into the bottom of each cup to desired height. You may have some left over. Let cool and set for two hours in fridge. STEP 2: Once the lime jello has set, dissolve contents of strawberry jello with 1 cup boiling water. Then add jello mixture, cold water, vanilla, strawberries and cream cheese to a blender. Mix well until all ingredients are blended smooth. Transfer to a bowl and gently fold in cool whip (or generic whipped topping…that’s what we used!) until mixed. Next, pour into your dessert cups. Let set an additional two hours in the fridge. STEP 3: Place chocolate chips on top to look like watermelon seeds. STEP 4: Wow your guests with this fun and refreshing treat, perfect on a hot summer day! If you have any questions, please leave a comment below and I will get back to you right away! And I really hope that your guests love these as much as ours did! Whether you’re headed to a picnic or any summer party, we hope you have a great time!! If you’d like to save this for later, use this graphic to pin this recipe! Oh no! I’m sorry, I just saw your comment…so too late…in the future I’d probably freeze the strawberries and thaw right before using! Hi!! Love this idea, but I have a question! I have strawberries that might so soft and slightly spoiled by Saturday, but have an event that day I’d love to serve this at. My question: how long will the assembled jello and mousse keep together in the fridge? ?